Do you still use your balcony for storage of old sledges, skis and other rubbish, which may never be in use? Given the constant rise in real estate prices, such use your own square meters can be hardly called rational. 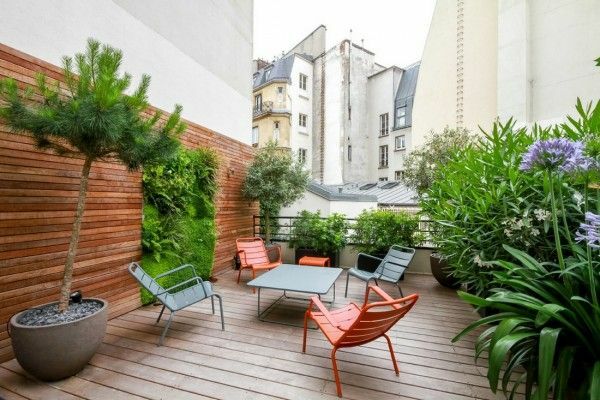 How about getting rid of all unnecessary things and turn balcony, used as a smoking room or a place for drying laundry, into potential new premises for office, home studio, dining room for a short meal or even a summer bedroom? No matter what space constitute our apartments but the freedom is always lacks. We offer you a selection of 100+ trendy design ideas of balcony and loggia 2017 with photos. 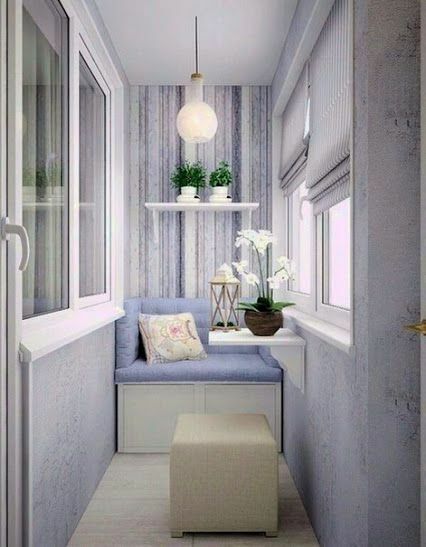 Arrange your additional space with a variety of functional purpose. Before you turn precious 2-5 square meters into a cozy nook that will be your source of pride, you need to develop a detailed action plan. First of all, you must decide whether your work on beautification of the balcony or loggia would be decorative (construction remains open and only the facade is sheathed with finishing material) or constructive (balcony glazing and insulation). The choice will depend on your personal preferences and expectations. Some people is living in the south and have a magnificent view of the sea that opens directly out of their balconies. Such a structure is sufficient to be refined and built up with a place for meals to have a gorgeous view of the seascape. And someone will have their not glazed balcony covered with snow for the most of the year and its arrangement will require a considerable number of activity. But first things first. Have the opportunity to be in the open air, without leaving your own home is a great idea for those who live in the southern part of the country. In terms of the open facade balcony design, the owners have not so much options. In addition to the traditional covering material, the construction can be decorated with the original forging and live plants. It all depends on how decorated is your apartment building’s facade, and whether you want to keep the existing design of your own parapet or to stand out from the crowd. Durable metal frame with inserts of transparent, translucent or molded plastic of various colors (usually, the tone selected for the harmonious combination with the color of the facade of the building) often can be seen as a fence in modern apartment buildings. To create an original image of an open balcony, you can use a forged custom ordered and designed frame. In any case, before you plan reconstruction of the appearance of the outdoor balcony, find out whether the building has no historical value and whether the tenants allowed to register parapets at their discretion. for climbing plants, the ideal option would be a lattice, which are attached to the walls on the both sides of the doors. Obviously, the decorative approach to the design of the balcony is a seasonal event, matched for warm, dry weather. Therefore, all elements of the situation must be portable, lightweight and preferably foldable. Choose a compact garden furniture, which is not afraid of different types of influences – from damp to zapping in the sun. And be prepared for the fact that in a strong wind and rain you will need to bring back textile items (pillows, removable seats, blankets and so on.) to the home. While designing of closed type of balcony there are a way more design variations and types of functional fulfillment. Let’s review them in more detail. decoration of the new premises. sliding or swing-out design with plastic profile. If you need to implement the “warm” glazing, so the option of using plastic double-glazed windows is the best way to create high-quality thermal and acoustic insulation. Very often in such cases, is used carrying out of frames by 15-25 cm farther than the plane of the façade on order to expand the area of ​​the balcony some. 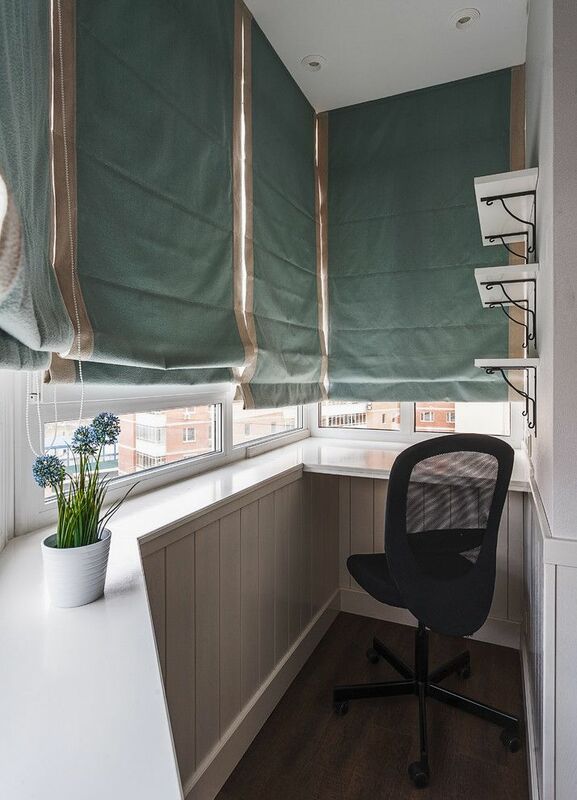 The feeling of space and a fairly broad window sill, which can be used as a work top is a great bonus for the hosts. In terms of decor and bringing originality to the design of the balcony by means of the stage of glazing, can be used tinted windows, stained glass, laser engraving or photo printing. Depending on the design decisions, use of such decor can be both fragmented so as for the entire surface of the protective glass barriers. Modern windows can be executed in any color scheme of the frames or simulate any type of wood. The original appearance of the glass surfaces is the key to creating a non-trivial image of the balcony or loggia. This stage of works must be taken with full responsibility. Do not save on materials and money for professional. Poor installation of heat and waterproofing may later negate all the finishing work, damage the furniture and eventually bring you back to the starting position with the need to rework the repair. Slight savings at this stage may result in significant costs for reconstruction and loss of time. Styrofoam often acts as the insulation for floors, polystyrene or technoplex – for walls and ceiling. Any heater is installed only after all the cracks will be removed and processed. Polyethylene foam that is placed inside the shiny side most commonly used lately to create a vapor barrier. Next, there is mounted a crate to create surface finishing. 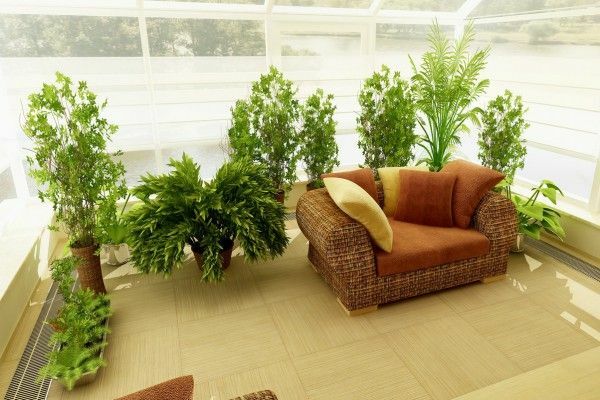 The most effective way of warming of the loggia is to set the so-called “warm floor”. One of the most democratic in terms of installation cost methods is infrared film floor. 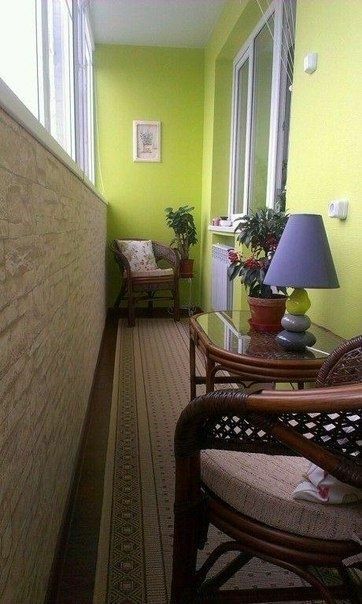 The room with such a floor is really warm and comfortable in all seasons. Temperature control modes allow you to set your own microclimate of the additional premises. 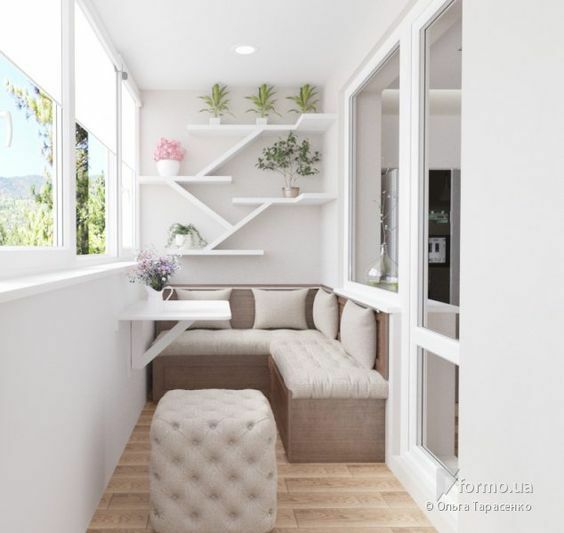 The scope of the installation works will depend on the expected number of light sources and the use of household appliances at the balcony space, the presence of “warm floor” and whether the loggia repair is carried out in conjunction with the renovation of the rest of apartment or not. If reconstruction is only related to the balcony, you can keep it simple and confine with conventional extender, pre-calculating the required cross-section with the maximum load. Number of light sources will directly depend on what you expect from your balcony or loggia to be. If this is the place for breakfast and a rare evening romantic dinners with the sight of the cityscape, and one lamp or built-in lighting will be enough. If additional space will be used as an office, shop or children’s play area, the single light source is indispensable. The number of fixtures is also influenced by the size of the balcony and its location in relation to the cardinal. combination of different materials to create original and sustainable coverage. If we talk about the choice of the color palette, it is obvious that lighter shades will look much more organic in a modest room in size, promoting visual expansion of the space. But, on the other hand, if all of your balcony’s (loggia) furniture and decor will be executed in bright colors, then the background can be picked up in more colorful colors too. 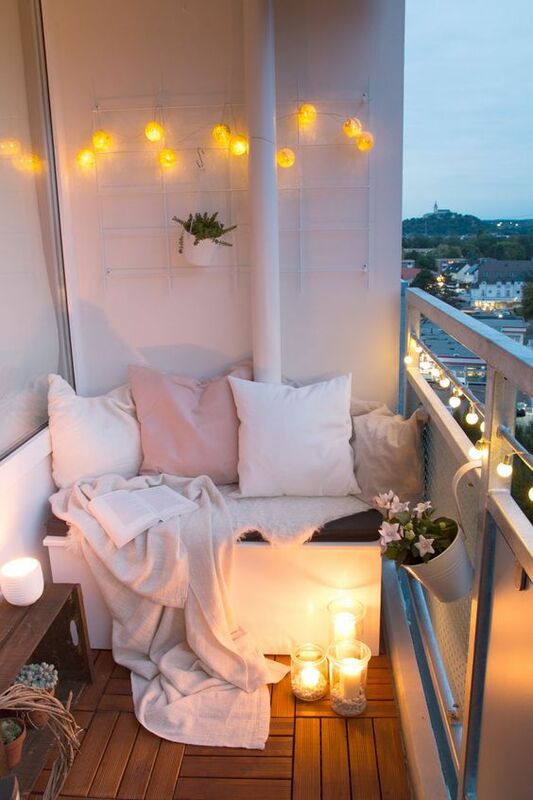 Only at first glance it may seem that the limited space of the balcony significantly reduces the list of possible options for using this additional space. Modern host does not use this utilitarian room as a storage room for a long time, and tends to arrange an office, workshop, greenhouse, children’s area, playground for adults with billiards, fitness, hookah; a place for meals and even the bedroom. In order to place the high-grade functional environment on a few square meters with a specific geometry, it is necessary to resort to various embodiments of design techniques. 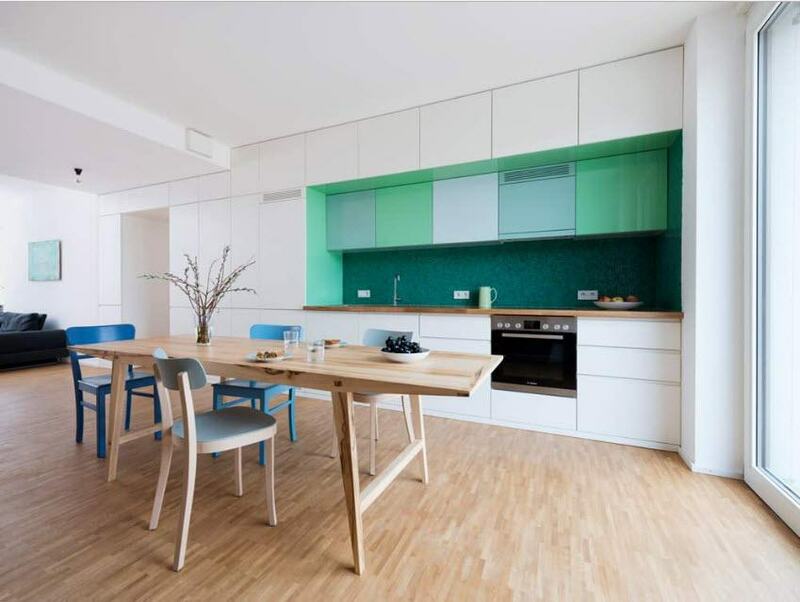 The case is not only a visual extension of the space through the use of bright trim, mirror, glossy and glass surfaces, but also the installation of compact furniture (usually custom manufactured on by individual sizes), the maximum release of the floor space – folding furniture, shelves and consoles, which are attached to walls. The place for dining is one of the most popular roles for a balcony or loggia. If your balcony has a great view of the city skyline or even better – from the windows you can see the sunrise or sunset, it would be unforgivable not to enjoy with such a wonderful opportunity. The width of some of the loggia allows you to place a compact dining table, while others must be content with a narrow bar or console (most often an extension of the sill). Also effective method is to install a compact round (oval) table or a folding panel. 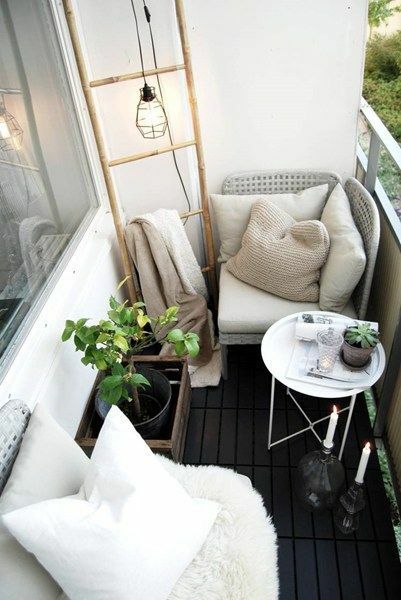 Another popular solution is to organize a nook for reading and relaxing at the balcony or loggia. 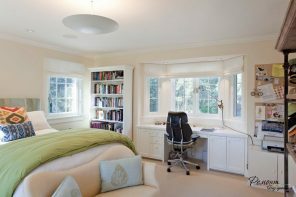 It is logical to install shelving for the home library and arrange a comfortable place to read books in the light-filled place. Even if the balcony glazing has frames, natural light will still be enough for a comfortable stay. In this case, in addition to the shelves of books, you will need to install a pair of comfortable chairs or compact sofa, ottoman etc. In order to organize the modern home office, you need quite a bit of storage space. It was such a modest size has a balcony or loggia. A small console can be used as a work surface (modern notebooks or desktop monitors take up little space), comfortable adjustable seat and a pair of hanging shelves for storing documents and office. 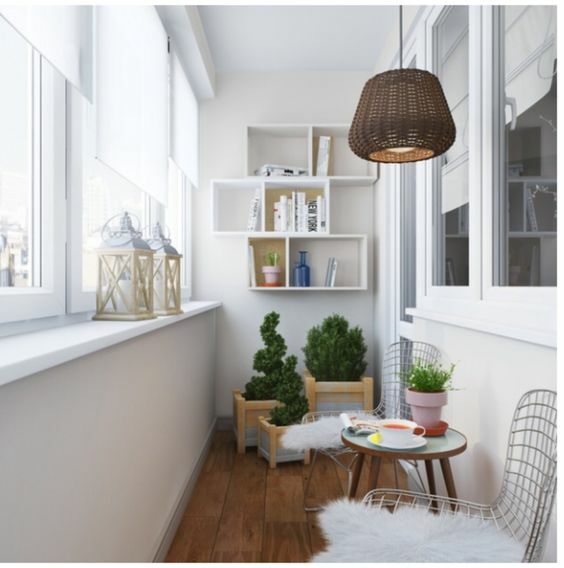 One of the most popular options for storage on the balcony spaces is to install shelving. Even a shallow floor-to-ceiling rack, allows to place a huge amount of household items. This design does not look massive due to lack of facades. No less popular are the built-in wardrobes. But considering that it is necessary to mount floor-to-ceiling storage system at a small area, it is better to give preference to lighter wood species. 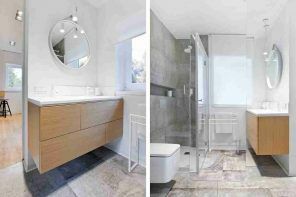 You may also want to use glass and mirror surfaces. They will help to ease the perception of the cabinet image. 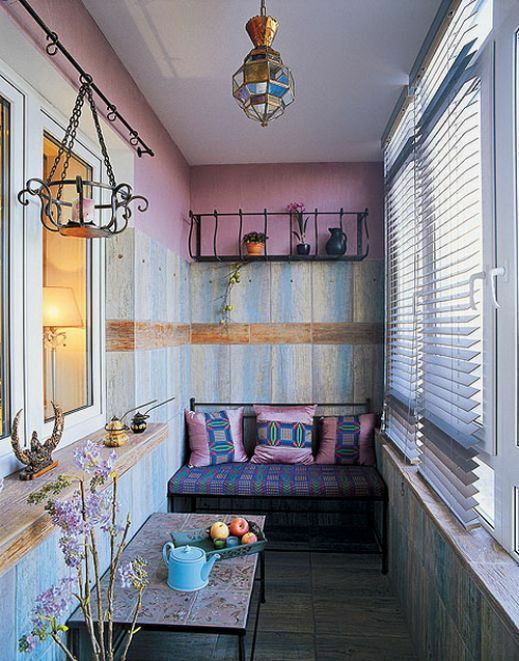 Even a small space under the balcony windowsill can be used efficiently. Shallow shelves hidden behind folding doors can accommodate a large number of necessary details. Corner sofas, having roomy storage under the seats are efficient to use as seating places. You can use similar, but linear type models for balconies of small width. Balcony is ideal for everyday items crafted with your own hands. For example, you can construct benches and sofas, tables and stands, racks and other storage systems, even the bed of the wooden pallets. Thus, not only saving considerably, but also creating a truly unique appearance of additional space. But there are modern design projects and quite unusual options for the use of available square meters. Gym, or rather a training mini-room, laundry, sauna or Russian steamer – this is not a complete list of creative ideas. But it is important to understand that for many organizations such original projects require not only great resources, but also the appropriate permissions.